Smart speakers are set to be used as ‘virtual medical coaches’ to monitor patients in their own homes, a major report says. 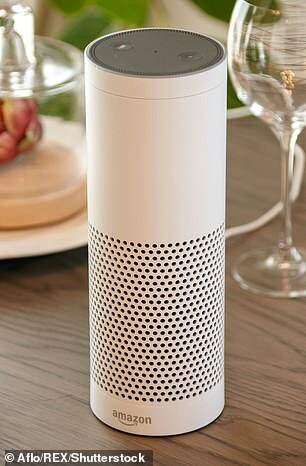 Devices like Amazon’s Alexa, Microsoft’s Cortana and Apple’s Siri are becoming crucial health tools, according to an official report on the ‘digital future’ of the NHS. The 100-page document, written by US geneticist Eric Topol, said robots and artificial intelligence will make medical diagnoses more accurate and unburden doctors to give them more time with patients. And it said within 20 years virtual medical coaches, operating through voice recognition speakers in people’s homes, would help manage chronic conditions such as diabetes, asthma, depression and high blood pressure. These programmes will use artificial intelligence and ‘deep learning’ about someone’s illness and normal behaviour to ‘pre-empt hospitalisation’ by spotting when something is wrong. They would connect to wearable sensors, medical data and even detect stress in someone’s voice to tell when their condition was deteriorating. The machines might then be able to warn patients they are getting ill, remind them to take medication or even send an alarm to the nearest hospital. The report, described last night as a ‘blueprint’ for the long-term future of the NHS, was commissioned in 2017 by former health secretary Jeremy Hunt to examine the possibilities and pitfalls of technological change. ‘The convergence and complementarity of three major technologies – genomics, sensors and artificial intelligence – will enable the development of virtual medical coaches,’ the report said. ‘[This] has the potential to achieve prevention for patients at high risk of a particularly illness, or at the very least help a person self-manage a chronic condition. It said the NHS in London has already used speech recognition software to create a ‘mental health triage bot’ that analyses someone’s voice to detect ‘emotion and suicidal ideation’. Elsewhere, hospitals are using speech-recognition machines to save doctors from writing notes. A trial at South Tees Hospital NHS Foundation Trust A&E found doctors saved three minutes for every patient. If rolled out across the NHS this approach would save 5.7million hours of time among GPs alone, the report said. ‘The benefit for the healthcare workforce to focus on patient interaction and care rather than the computer screen and keyboard is clear,’ the report said. It added: ‘In the future, many aspects of care will shift closer to the patient’s home, while more specialised care is centralised into national or regional centres. The report warned that the technological revolution could be considered intrusive, particularly when it comes to genetic information. And it said the ability of computers to speak with a human voice ‘might be seen as manipulative or deceptive’, warning that ‘users should know whether they are communicating with a person or machine’. Technology also has the potential to ‘exacerbate’ inequalities, it said, with evidence that digital health records have lower uptake among the poor and ethnic minorities. Dr Topol said: ‘Over the next 20 years three changes will inevitably happen: more and more people will have their genome sequenced; patients will generate and interpret much more of their own health data at home; and the speed, accuracy and scalability of medical data interpretation from artificial intelligence will grow exponentially. ‘These developments will change patients’ lives, change how clinicians work and change how healthcare services are delivered. Health Secretary Matt Hancock said the report would ‘act as a blueprint’ for the long-term future of the NHS. ‘Our health service is on the cusp of a technology revolution and our brilliant staff will be in the driving seat when it happens,’ he said. Already Samsung has revealed plans for a Bixby speaker to take on Apple’s HomePod, Amazon’s Echo and Google’s Home. Apple’s speaker will have a higher price tag than the Amazon Echo range, which begins at $49 (£49) for the Echo Dot. The speaker will provide a hub for appliances via Apple’s HomeKit system and establish a centre inside the home to lock people in to using other Apple services, according to the report. Google’s $130 (£105) Home speaker is triggered by the phrase ‘Hey Google’ while Amazon’s Echo uses ‘Alexa’. 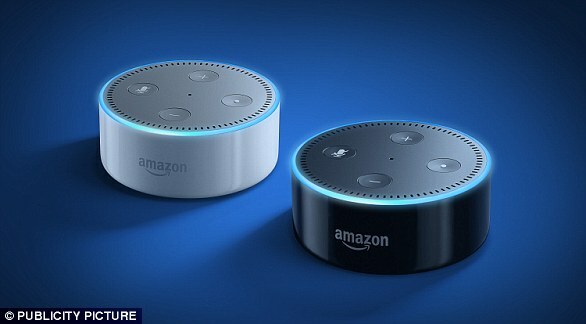 Amazon’s smart speaker is available in two versions – the full sized $180 (£145) Echo shown here, and a smaller, $50 (£40) version called the Echo Dot. Amazon Echo uses Microsoft’s Bing search engine to provide additional information, while Google Home uses the company’s own Google Search. Both Home and Echo are continually listening for commands, though Google and Amazon say nothing gets passed back to them until the speakers hear a keyword — ‘OK, Google’ for Home and ‘Alexa’ for Echo. 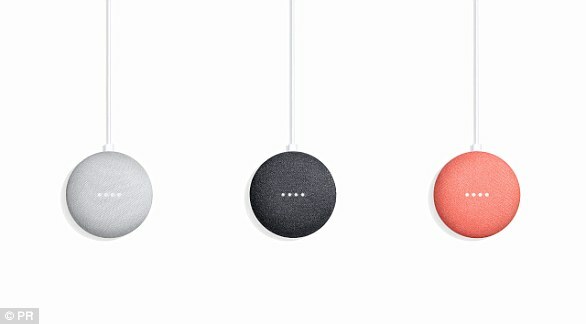 Google Home Mini: Google’s clever tech-filled $49 (£34) doughnut can do almosteverything its bigger voicecontrolledGoogle Assistantpoweredsibling can do,including answer questionsand control third-party devices. Google’s Assistant software is also able to answer follow-up questions on the same topic, in a near-conversation style, but Echo as yet cannot. However, Amazon’s Alexa software has a wider range of skills on offer that enable it to link up with and control more third-party devices around the home. A light comes on to remind you that it’s listening.